Exquisite, water-clear, A-Grade, multiple phantom polished point, from Brazil. This gorgeous specimen is superb quality with beautiful, multiple, white phantoms. The phantom is created during the developmental stage of the crystal's life; charting some of the changes it has undergone, and in this case the magical specimen has no less than nine phantoms, some more defined than others, as shown in the photo. 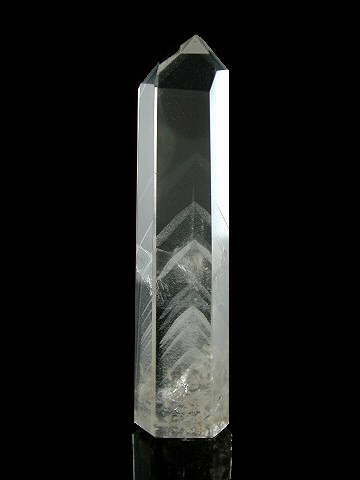 The ghosting inside this crystal is so precise it looks as though it were cut by a laser; the 3D effect is amazing, but we can assure you that this is absolutely genuine in every respect - another one of Mother Earth's little miracles! Phantom crystals are ones which have a 'ghost-like' crystal inside of them - and when found in a point, this 'ghosting' is the same shape as that of the outside of the crystal. Phantoms store information gathered over millennia and are, therefore, super for helping us access the Akashic Records, and it is said that they can start opening up the spiritual hearing process and can aid clairaudience. They are first rate at activating a person's healing abilities by assisting connection with spirit guides, so are of great use to healers old and new. If you feel that your energies are low or depleted, try working with a Phantom crystal to get reconnected. The phantom is created during the developmental stage of the crystal's life, and in this instance they're caused by the mineral Kaolinite; a soft, clay like substance. Kaolinite can help stabilise spiritual energy, and, therefore, can be of benefit where an individual has made rapid spiritual growth, but feels the need to slow down somewhat in order that they may take stock of their progress and direction. Physically, Kaolinite included Quartz has been used to treat digestive disorders, especially those relating to the stomach. This specimen also has a little lodalite at the rear, base of the shaft, which is this instance, is created by white calcite. Lodalite is a type of minaral included Quartz; most often, but not limited to, Iron, Chlorite and Calcite. These lovely inclusions give the impression of looking at a rocky or coral seabed through a glass-bottomed boat. Some also look like landscapes captured in Quartz, or a kind of underwater garden.. This crystal's lodalite inclusions, whilst very small, resembles little coral outcrops in its base.